I hadn’t really considered the question until this morning. 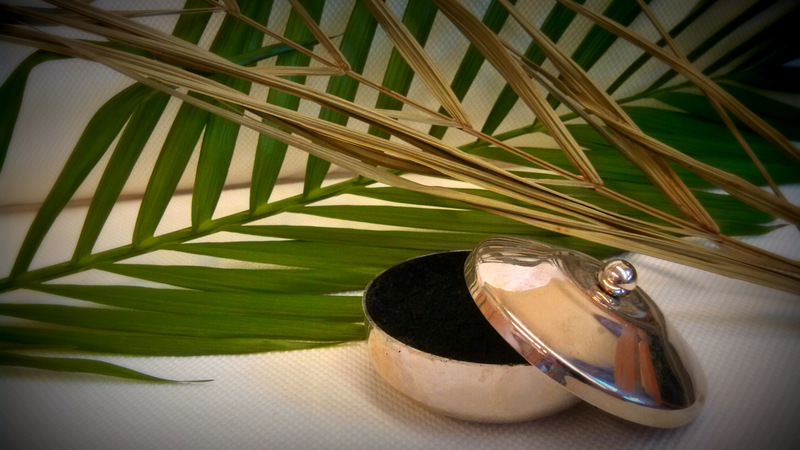 As part of our faith formation time with the prek- 4th graders, I showed them the ashes and a dried palm leaf. I try to do this each year to encourage them to come to the Ash Wednesday service. I want them to mark the start of the season of Lent and to recognize that it is a special time. I want them to feel fully included in the life and tradition of our church. I hope that by seeing the ashes up close they realize there is nothing to be afraid of. This morning as I passed around the dried palm many of the children unexpectedly tore off a tiny piece, which they examined as I opened the ash container. The circle shrank as they moved in for a closer look at the shiny silver container filled with black ashes– and then asked to smell them! Still surprised, I held them out. I heard a few words of description like “burnt” and “dark.” Last year my daughter thought they smelled like burnt popcorn – perhaps it is the oil? I am once again reminded that children experience life, including church life, with all of their senses. I enjoyed seeing the ashes through their eyes; ordinary ashes became interesting and amazing. Thanks be to God for the wonder of it all! Each year I send out an Ash Wednesday invitation to parents with children. I reference two great blog posts that do a beautiful job of helping adults explain the symbolism at the beginning of Lent. Both can be found on this previous Ash Wednesday post. 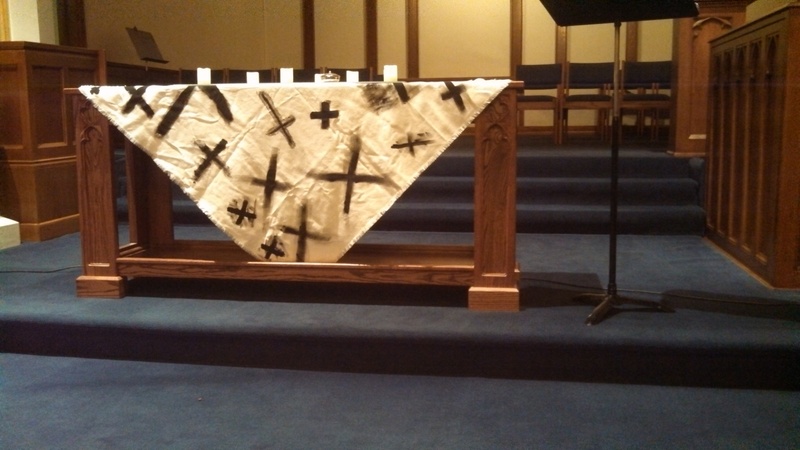 Ash Wednesday Altar Cloth painted by the children. Thanks to Worshiping with Children for the Inspiration! At my last church, I started a family service for Ash Wednesday that began outside as we burned the palms and then made our way inside for either a prayer station style service or a more traditional order of worship but with everything appropriate for non-readers (simple kyrie, responsive liturgy, etc.). A church that wanted to include children in a regular service could burn the palms and include a teaching moment for them before the service started. (Of course you would still need to burn palms in advance as these do not cool in time to be used in the service!) It was one of our best attended services and even drew in people from other churches where families didn’t feel included in their “adult” services. I love the idea of a prayer station style service. We’ve burnt the palms outside before, too, but in Chicago they cool pretty quickly!